Nintendo’s vacuum cleaning pink blob has been around. Indeed, 2017 just so happens to be the unlikely hero’s 25th anniversary. Celebrations have been oddly quiet for such a momentous occasion however, with three spin-offs seeing release on the 3DS, but not a boxed release until now, with Kirby Battle Royale, a collection of wacky-mini games held together by a thin plot involving cake. The 3DS has been a fantastic place for fans of Kirby, with two smart, fun and gorgeous traditional offerings in the shape of Triple Deluxe and Planet Robobot. Along with these, we have seen the releases of downloadable titles Team Kirby Clash Deluxe, Kirby’s Blowout Blast, Kirby Fighters Deluxe and Dedede’s Drum Dash Deluxe. It’s safe to say that if you’re a fan of the ability copying heroic pink blob then the 3DS is the console for you. The latest title to see release is another spin-off for everyone’s favourite hungry hero in which you battle against Kirby’s greatest enemy yet – himself. Although primarily made as a multiplayer experience, you’ll be playing Kirby Battle Royale by yourself for the most part, thanks to a bright and breezy story. This sees Kirby invited to enter into King Dedede’s Cake Royale tournament where the grand prize is a magnificent cake, and Kirby, the glutton he is, of course accepts the invitation to claim the delicious prize. The story opens with a simple level that sees you traverse across a top-down landscape filled with various nefarious traps such as bottomless pits, enemies and spikes to jump and flutter over. You end up having to carry an exhausted Waddle Dee through to the hub where you’ll later spend your time picking what contest to tackle next and even talk to the several Waddle Dees that are cheering you (or other Kirbys) on. On first impressions, Kirby Battle Royale feels like a neat top-down Kirby RPG of sorts, where you can talk to whatever Waddle Dees you see on screen and do things like fight your traditional selection of enemies on top-down levels with classic copy abilities to choose from and unlock, maybe even level up. I truly wish this is what we got with Battle Royale, but it is sadly not the case. Instead, you are challenged by King Dedede (who may or may not be plotting against you the entire time) to tackle various mini-games and rise through the rankings all the way into the Platinum rank in order to face the final boss and take home the prized gigantic cake. Along with your trusty umbrella equipped Waddle Dee, you must fulfill Kirby’s sugary destiny. Each ranking level in the story mode will see you challenging a selection of contests, each worth a different amount of points, in order to fill up your completion bar (rises from 100 points up to 500) to take on the final stage for each rank. Along the way, you will unlock new copy abilities that are all simple to control (you press “B” to do a normal attack, “Y” for a special and can chain regular attacks or charge them up to unleash devastating damage), but there will be ones that you prefer using. For example, the long range grabbing abilities of the “Whip” ability really helps in most mini-games. There are plenty of abilities to unlock and if you know your Kirby games, you’ll recognize the lot of them. Your standard Sword, Bomb and Fighter are all their, along slightly more obscure ones like Spear, Ninja and Tornado, but there was sadly no room for the classic Fire ability. Despite their simple controls, each one offers a unique way to play the game. 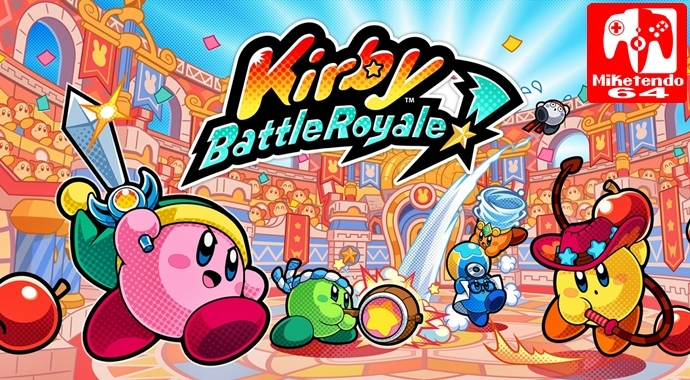 While fighting your way through a bunch of mini-games might not be exactly what you want from a Kirby game, stick with Battle Royale and it will surprise you with just how fun it can be. Each mini-game offers up gameplay that (when played in multiplayer) can provide exciting, tense and hectic fun. Apple Scramble, for example, sees you collect apples in a team game (2v2 or 1v1) by knocking them off of miniature Whispy Woods via attacking them, picking dropped apples up with a press of “R” (as many apples as you want) and throwing them onto a platform that you can open, winning points for each apple collected. It can get intense when played in multiplayer and there are different strategies you can adopt. You can simply collect apples and try to drop them in your respective hole, or you can choose to help your teammate by fighting your opponents, making it much harder for them. A lot of the mini-games can work like this, but Apple Scramble, Rocket Rumble and Ore Express are the strongest of the lot. In Rocket rumble you are tasked with collecting green and yellow cubes of energy to throw them into your rocket ship (can be played in teams of a free-for-all), which you must jump into before the time runs out and blast off, to see who can climb the highest. Do you focus on simple energy accumulation, or do you make it harder for your enemies by attacking them or their rocket? It’s up to you. Ore Express is similar enough to Apple Scramble, but sees you throwing ores onto a moving train in a map that moves itself. Other mini-games such as Flagball (you throw the ball into the correctly coloured flag) and Slam Hockey (you throw a hockey puck around a stage at your enemies in a team or free-for-all) are good fun, but not quite as detailed as the three I spoke about above. Crazy Theater, however, deserves some credit. In it, you are tasked with completing an objective before the timer runs out. These are simple tasks such as standing on the correct answer to a simple maths problem, dodging or dishing out attacks and dodging things like asteroids and lightning strikes. It’s a fun mode, but it doesn’t quite carry the detail or scope as the ones above. While these are all good fun, the rest of the games are a little dull. They are all okay, but you won’t love them. Coin Clash is the best of the rest, but it isn’t wonderfully exciting and just sees you attempt to collect the most coins and escape a pesky ghost that drains your funds. Robot Bonkers tasks you with attacking a giant robot monkey by, at first, throwing missiles at him via cannons and then smashing him with standard attacks to build up points. Attack Riders again is okay, but it can be quite tricky if you can’t time your smashed with the super bikes to win a bunch of money. Battle Arena, which sees you fight other Kirbys is the weakest of the lot and you just won’t bother with this simple fighting arena all that often. It does become a bit of slog towards the end of the story mode, with you needing to beat quite a lot of easy mini-games against the computer (being teamed up with your relatively rubbish Waddle Dee partner can be a pain too) in order to accrue the correct amount of points needed to move the story on. You’ll rarely be challenged in the three-four hour campaign, and you may get tired of replaying through all of the mini-games over and over again by the end. It can be surprisingly fun, but it does get dull towards the end despite its short length. Thankfully, you can play through any of the mini-games by yourself, online and in local multiplayer with download play supported. Playing the games in multiplayer gives Battle Royale a shot in the arm. Playing against other people makes each mini-game more frantic, difficult and more fun. You’ll need to react quickly in even the weakest of the games if you want to win. Playing in multiplayer also allows you to use everything you’ve unlocked such as new skins for each ability, different colours, power orbs (power-ups that increase speed, strength and other such stats for a short while) and even lets you play as bonus unlockable characters. If you scan a supported amiibo you will unlock cool skins to use (try out the Kirby series of amiibo here). All of these unlockable items (including the likes of individual tracks from the game’s lively soundtrack) have to be paid for with in-game currency which is won when you win matches online and off, and when you are awarded with one of Battle Royale’s many achievement medals (you are told how to unlock them on the awards page). There is plenty to do in Kirby Battle Royale, but it is all a little one-dimensional and will grow tired relatively quickly. I’ve put several hours into the game and it is starting to feel a little flat, which just isn’t good enough for a full-price physical release. It would be easier to recommend Battle Royale If it were cheaper, that’s for sure. It would be easier to recommend if it were playable using the 3DS’s 3D images, too, which frustrates me as the game looks great, but would look far nicer if we were able to play it in 3D. It’s frustrating too, that you cannot play a match online until you find four people, which means you can be waiting for quite a while before you find a match. Worse still, the online is only playable in ranked mode that doesn’t pair you with players who have a similar rank to you. Kirby Battle Royale is at its best when played in local, four-player multiplayer, where it can be a blast and reminiscent of Nintendoland. Kirby Battle Royale is a missed opportunity. Instead of a collection of decent, but ultimately simple mini-games, it could have been a top-down Kirby action-adventure style RPG. You will have fun with the game, but its short length and few excellent mini-games won’t keep you invested for long. It can be a surprisingly fun. hectic experience, especially in multiplayer, but it simply isn’t worth dropping £30 for. This is a B-tier Kirby release on a console full of quality Kirby titles. If you haven’t yet, I’d pick up Triple Deluxe or Planet Robobot over this decent, but ultimately shallow experience.